He was doesn't fight has to lie there dead forever!! DON'T BE A PRIVATE PRO-LIFER BUT BE A PUBLIC PRO-LIFER IN FRONT OF PLANNED PARENTHOOD OR OTHER ABORTION MILLS IN ROCHESTER. JOIN US TO HELP SAVE A LIFE! "The Pro-Life Movement will succeed only to the extent that pro-life people are willing to be inconvenienced." - Douglas R. Scott, Jr.
Until we have the right to speak out and raise our voices in protest, then no one of us will be free!! 3.People who wondered what happened!! by Gibbs & Chestnut St.
Come join the "LAMBS OF CHRIST". They are a group of dedicated people who come out in front of Planned Parenthood to pray the Rosary on the 2nd and 4th Saturday @ 10 AM of every month, for the past 13 years. PLEASE JOIN THEM. NO CONFRONTATION. Join us. You may save a baby’s life. Just show up. You will be welcomed !!!!! The Rosary is said while walking on the sidewalk in front of the Hospital to end abortion at Highland Hospital. Description: Every Friday, we are holding a peaceful, prayerful, wholly non-confrontational witness against the horrific crime of abortion being carried out in our nation and our city. At 3:00 PM, the hour of Divine Mercy & the Sorrowful Mysteries of the Rosary we will meet in front of Morris Wortman’s Clinic, 2020 S. Clinton Ave. –where these monstrous abortions are committed. These prayerful witnesses are peaceful and wholly non-confrontational. We say the Divine Mercy Chaplet followed by the Sorrowful Mysteries of the Rosary. It is a time of quiet prayer and reparation every Friday at three. So, join us each Friday at 3:00 in front of Morris Wortman’s Clinic (just south of Tops Plaza) in peace, witness and protest against the horrific crime of abortion. For more information, contact Jeanne Horvath at 482-7252. The mission of GOPUSA is to spread the conservative message throughout America. GOPUSA strives to educate, enlighten, and engage conservatives through a host of features and services including news, online discussions, commentary, activism, outreach, and information. Through a host of products and services, GOPUSA is committed to providing conservatives with news, information, commentary, education, activism, and community both online and in person. We strive to be the first source Republicans and conservatives turn to for news and information, both at the state and national levels. All content, products, and services delivered by GOPUSA reflect our dedication to professionalism, quality, and innovation. Take Action Today To Stop Illegal Abortions! 1.) Am I fully convinced that every abortion, at every stage of pregnancy, is the destruction of an innocent human life, which has the same value as my life, my parents’ lives, my children’s lives? Do I foster and nourish this conviction by reflecting often on the tragic loss of life occurring daily around me? Do I ever allow myself the thought that someone else's abortion is "none of my business?" Do I sometimes think that I have "more important" things to do than to save innocent lives? Do I believe I am responsible for my preborn brothers and sisters and accountable to God for what I do to save them? Do I have the courage to remind myself of the horror of abortion by actually looking at the pictures of aborted babies? 2.) Do I pray daily and explicitly for an end to abortion? Do I pray for the babies, the mothers, the abortionists, the legislators, the media, the clergy, and the whole pro-life movement? Do I fast or make other significant sacrifices for this cause? Or do I believe the fight against abortion can be easy and convenient? Am I too afraid of displeasing others, and do I think I need to be liked to be successful? Am I willing to undergo financial loss, ridicule, or other sacrifices, to save a child's life? 3.) Do I see the link between abortion and other assaults on human life and dignity? Do I acknowledge that progress in any arena for the defense of life facilitates progress in all the other arenas? 4.) Do I have faith that God is the Lord of Life? Do I believe the whole struggle is in His hands, and that He has already conquered evil, falsehood, and death? Do I trust Him? Do I ask His guidance? Do I keep my eyes on Him, or do I allow discouragement by focusing only on the problem and myself? 5.) Am I learning more about abortion and about the pro-life movement? Do I read good pro-life books? Do I subscribe to at least one pro-life publication so that I can be well informed on the issue? Do I escape from taking action by thinking that prayer alone is enough? Am I developing all the talents God gave me so that I can use them to advance the Culture of Life? 6.) Do I speak up in defense of life? Do I make full use of the opportunities I have, such as wearing pins or using bumper stickers or decals? Do I write letters to the paper or to legislators or to doctors? Or do I allow a lack of self-confidence to paralyze my activity? Do I only do what’s comfortable, or do I try to discover what activities will be most effective? Do I gladly participate in projects that need to be done, even if I don’t particularly want to? Do I try to come up with new ideas for pro-life work? Do I suggest these ideas to others? 7.) Do I take proper care of myself, physically and spiritually, so that I can be more effective in my pro-life work? Do I rest when I need to? 8.) Do I foster unity in the movement? Do I encourage my fellow pro-lifers? Are all of my efforts guided by charity? Do I allow unhealthy competition between pro-life persons or groups? Do I foster collaboration, without demanding uniformity? Do I follow the advice or direction of those who bear responsibility for pro-life projects or groups? Do I seek the advice and input of others in the movement, especially of those more experienced than I? 9.) Do I try to grow in compassion for women who are tempted to have abortions or who have had them in the past? Do I try to understand their situation and learn more about their needs? Do I help women find alternatives to abortion? Do I inspire hope in women I know who have had abortions? Do I help them find forgiveness and healing? Do I foster charity in thought, word, and deed toward those who disagree with me, or who perform or promote abortion? Am I fully committed to non-violence in this struggle? 10.) Am I ready from this day forward to be a better pro-lifer? Am I ready to launch out with new strength, generosity, and determination to bring an end to abortion, without counting the cost to myself? Am I grateful enough for the gift of life to work to give life to others? Do I thank God for the privilege of being part of the pro-life movement? To object that Carol Love, Ex President of the killing mill Planned Parenthood, is on their board as a Chairperson. How sick!!! A pro-life group that monitors corporations that give contributions to Planned Parenthood has released a new boycott list. Life Decisions International hopes pro-life advocates will consult the list before making purchases at some of the leading companies in the United States because they support the number one abortion business. Doug Scott, the president of LDI, tells LifeNews.com that the boycott list has proven effective over the 15 years the group has targeted corporate Planned Parenthood sponsors. "As a direct result of the commitment, action and prayers of pro-family people, at least 153 corporations have stopped funding Planned Parenthood," he said. Scott estimates that the boycott has cost Planned Parenthood more than $35 million over the period after corporations targeted by the boycott relented. He added: "This should be a testament to those who believe it is impossible to change corporate philanthropic behavior." and the Sierra Club, among others. "The Pro-Life Movement will succeed only to the extent that pro-life people are willing to be inconvenienced," Scott said. "The very lives of children are worth that much effort and a whole lot more." 175 Pro-lifers & their children came out to oppose Gov. Spitzer's radical and extreme abortion bill (NY Senate bill 5829.) (Titled the future of reproductive health in New York State). Pro-Abortion Clergy Bless New York Abortion Business as "Sacred Ground"
Albany, NY (LifeNews.com) -- In an act that is sure to generate guffaws from the pro-life community, a group of pro-abortion clergy in Schenectady held a ceremony at a local abortion business to bless it and call it "sacred ground." Religious officials who are pro-life call the ceremony sacrilegious by blessing a place that kills the life God creates. Rev. Larry Phillips of Schenectady's Emmanuel-Friedens Church dedicated the ground, according to a report in the Albany Times Union. He called the abortion facility "sacred and holy ... where women's voices and stories are welcomed, valued and affirmed." Phillips said the abortion business was "sacred ground where women are treated with dignity, supported in their role as moral decision-makers ... sacred ground where the violent voices of hatred and oppression are quelled." Another minister prayed for safety for the abortion business and a local rabbi blew a shofar to dedicate the building as an honorable place in the community. "The clergy were instrumental in getting abortion services legalized in the United States and right here in Schenectady," she added. 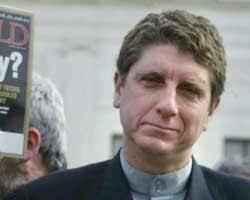 "I know a member of the clergy who was part of an underground who directed young women to safe abortions before Roe v. Wade." But Kathleen Gallagher of the New York State Catholic Conference told the Albany Times Union that the blessing is hypocritical. "My gut reaction is that it's two-faced," Gallagher said. "For many years abortion proponents have been saying this is not a religious issue, you should keep religion out of this, and now all of a sudden they turn around and decide to bless an abortion clinic to gain respect for a procedure everybody knows is not worthy of respect," Gallagher added. "We are happy to say that we are giving away baby clothes for the moms & their babies. The only problem is that we are running out. We need more. If you can donate baby boy & girl clothes new &/or slightly used that would be GREAT!! Just call Mary @ 218-4051 & leave a message & she will call back ASAP to make arrangements for pick up. Do you want to see the end of Roe v. Wade? Do you want to see an end to killing children and wounding women and men who participate in abortion? You can help by becoming a Declaration Ambassador for Operation Outcry ( http://www.operationoutcry.org). Operation Outcry is a project of The Justice Foundation to reverse Roe v. Wade which has proven its effectiveness already at the United States Supreme Court. Call the City Newspaper & object to the Planned Parenthood Ad, to which they advertise the killing of innocent, little babies. Call News Channel FOX 31 @ 232-3700 Newsroom for interviewing Morris Wortman Abortionist on News at 10PM on March 11th. 2009. I called to complain & was told that the reporter did not know that he was an abortionist but when I spoke with Megan, the reporter in the Newsroom, I was told by her that it would not have mattered. It was their right & they would not be swayed even if they knew he was an abortionist. I told her that he murderers’ babies but that didn't bother her at all. It was their right to interview an abortionist if they wanted to. Do you Fox News know how many babies Wortman has murdered & how many women he has hurt over the past 27 years? He stated that he does 1,000 abortions a year, you do the math of how many people he has killed in cold blood for $. He is not a nice person either, though how could he be when he murders little babies & ruins women’s lives. At Highland Hospital in 1986 when I worked there as a nurse he grabbed my arm as I was walking down the hall & he twisted me & hurt my back which affected my right leg, which is painful to this day. Do you realize Fox News how many women & men who saw your news was traumatized when they saw Wortman's face on the TV. Please realize that he has nothing worth wild to say or for us to listen too. There are stories that would curl your hair about Wortman. Maybe in the future I'll share more. One involves a Channel 8 story back about 10 years ago when he had his lady friend, while married, spy on me & he paid her to, etc. Teresa Tomeo was interviewing Dr. Monica Miller this am in regards to an abortionists dumpster that contained all kinds of patient records, medical waste and aborted babies parts and the investigation that will hopefully bring criminal charges against this abortionist and his facilities. You can watch on You Tube here: http://video.aol.com/video-detail/hodaris-dumpster/2133096551 what they found. As everyone can see it’s a very ugly business and a crime against sacred souls and Our Good God. Maybe reality will change hearts and save lives? The following is his complete video in Spanish including pictures of American children put to death by abortion. Los Angeles, CA (LifeNews.com) -- Eduardo Verástegui, the former Mexican singer and actor who starred in the hit move "Bella," has recorded a new video asking Hispanic voters in the United States to reject Barack Obama because of his pro-abortion views. Verástegui challenges Latino voters to make abortion issues the centerpiece of their voting decisions. In the new video, conducted in Spanish, Verástegui, says Obama is out of step with the overwhelming majority of Hispanics who are pro-life. “We need to put an end to abortion and political candidates play a very important role in this matter,” he says. Verástegui tells viewers that Obama supports abortions throughout pregnancy, including late-term abortions, and has opposed a ban on partial-birth abortions. The Bella star also talks about the votes Obama cast during his tenure in the Illinois legislature that would deprive newborn infants of medical care if they survive botched abortions. He says Obama “voted on several occasions against a law to protect babies who survived an abortion and were born alive." Verástegui describes the bill Obama said he would make his first signature as president, the Freedom of Choice Act, that makes legal all abortions throughout pregnancy and overturns every abortion limit in all 50 states. “Obama is committed to removing all the pro-life laws that in many states currently offer protection to unborn babies and their mothers. Mr. Obama does not agree that the parents of a 13 year-old girl who is pregnant should be notified before she has an abortion,” he explains. “Obama is more interested in maintaining the legality of abortion that in the well-being of the babies, children and families of this country. Let us unite and do something to defend life at every stage, from conception to natural death,” he adds. During the video, Verástegui punctuates his comments with images of unborn children and pictures of babies who died in abortions. He also condemns how abortion advocates frequently place their abortion businesses in Hispanic communities. “Abortion is not only a lucrative industry; it is also used by people who are racist as a means to eliminate our people, since they consider us to be a threat to democracy in this country,” Verástegui says. LifeNews.com Note: Matt is an attorney with the Alliance Defense Fund, a leading pro-life law firm. This article concerns the so-called Freedom of Choice Act that presidential candidate Barack Obama said he would make signing his first action as president. With so much attention on the economy, one area of federal legislation that can be overlooked is abortion. An old and dangerous bill that will increase abortions by an enormous amount is being resurrected by abortion advocates: the Freedom of Choice Act (FOCA). H.R. 1964 and S.1173. FOCA is usually reported as “codifying Roe v. Wade,” but it is much more. Since the Webster and Casey decisions in 1989 and 1992, the Supreme Court has allowed states to limit abortion somewhat by such things as requiring parental involvement and informed consent, prohibiting government funding of most abortion, and more recently outlawing most partial birth abortions. But FOCA tolerates none of this. Advocates and opponents of FOCA all agree that the bill would nullify every legal limit on abortion, state, federal or otherwise. Americans United for Life, as well as the Family Research Council, explain this fact in great detail. Abortion advocates who want FOCA concur: NOW, NARAL, Planned Parenthood, and FOCA sponsor Senator Barbara Boxer all contend that FOCA will strike down all state pro-life laws. The shockwaves that FOCA would cause are immense and wide-ranging, but recent research shows one effect in particular. Certain state laws that are doomed under FOCA actually prevent a statistically significant number of abortions. These laws include parental involvement requirements, informed consent laws, and restrictions on government funding of abortions. Specifically, if FOCA is passed it will increase abortions by 125,000 more per year in the United States. Since 2004, Dr. Michael New has published studies with the Heritage Foundation showing that a large reduction in abortions can be attributed to these three kinds of laws. Even considering other reduction factors such as change in public opinion, Dr. New’s regression analysis shows that parental involvement laws in a state lead to 0.54 fewer abortions per 1000 women of childbearing age, informed consent laws lead to 0.92 fewer, and state restrictions on Medicaid funding lead to 2.08 fewer. Both pro-life and pro-abortion organizations tell us which states have these laws in place: 36 states have parental involvement laws, 26 states have informed consent laws, and 34 states have funding restrictions. The U.S. Census Bureau gives us projections for 2009 of females age 15-44 in each of these states. Then it’s a simple matter of cross-referencing the number of women of childbearing age in each state with each abortion restriction, and applying Dr. New’s ratio. The grand total number of abortions reduced by these laws is 124,947.6, per year. This is a minimum. FOCA will strike down other laws, state and federal, that reduce abortions, and will force states to facilitate abortions. 125,000 more abortions is only the tip of the FOCA iceberg. Even with this minimum, that’s 125,000 children that were not killed this year because we have these laws, and 125,000 children (added to the existing 1.3 million abortions) who will be killed in 2009 and every year after if FOCA is passed. FOCA is indeed a staggering expansion of abortion, both in principle and in actual lives lost. Infanticide! This Has Nothing To Do With Roe v Wade! Bob Barr 08! Want to learn how to run an effective campus pro-life group and how to save lives in your spare time? Check out SFLA's new Training Website. Sign up your campus or statewide group to receive training from SFLA's professional trainers. Attend the Young America's Foundation Midwest Conference in Chicago, March 13-14, to learn the arguments and ideas that make this country great and network with your peers from around the country. Please visit this site to learn more and register now. Join the "Facebook for Pro-Lifers!" Get conntected with student leaders from across the country as well as SFLA staff and other organizational leaders. Check out SFLA's Radio Show, "On Campus with Students for Life." Click here to listen to our recent episodes! We feature a different campus pro-life group every show! Attacks Coming to Crisis Pregnancy Centers! Learn the Strategy and Defend CPCs. Today, SFLA received an alarming e-mail from the Feminist Majority Network (FMN), a pro-abortion organization. The group has launched an effort called the "Campaign to Expose Fake Clinics." Read about their strategy here. Their goal is to shut down Crisis Pregnancy Centers (CPCs) and prevent them from advertising on college campuses. Simply put, they are afraid of the knowledge CPCs offer women. They don't want word to get out that abortion kills children and harms women. FMN posts on their website about CPCs: "Some fake clinics coerce and intimidate women out of considering abortion as an option, and prevent women from receiving neutral and comprehensive medical advice. They are typically run by anti-abortion volunteers who are not licensed medical professionals." Now, they have declared April 13th National Crisis Pregnancy Center Protest Day. Crisis Pregnancy Centers need you to fight back and be their voice on campus! Organize your group to volunteer for your local CPC on April 13th. Go here to find your local CPC. Advertise the resources your local CPC offers on campus. Bring the director of your local CPC to campus as a speaker. Defend the right of CPCs to advertise on your campus. Last Thursday, Rev. Walter Hoye of Berkeley, California was sentenced to serve 30 days in county jail and fined $1,130.00 by Judge Hing of the Alameda Superior Court after being found guilty on January 15, 2009, of unlawfully approaching a person entering an abortion clinic in Oakland, CA. The court is allowing Rev. Hoye to serve his time by an alternative method like community service. Rev. Hoye was also ordered to stay away from the clinic. However, Rev. Hoye refused this term of probation and would not agree to a stay-away order. Nonetheless, the judge is having the order drawn up and refused to accept Rev. Hoye's decision not to agree to the stay-away order. Read more about Rev. Hoye's case here. The University of North Carolina - Chapel Hill Students for Life has shown excellence in many areas. This group is continually recruiting, whether it be at their campus organization fair, tabling, clipboarding, or going to other group meetings to invite members to come to their meetings. As new contacts are made, officers split up the list of new members and everyone gets a Facebook friend request, email, and phone call from an officer inviting them to the meeting. They're dedicated to forming relationships with each person in the group. As a result of their presence on campus, this group has been instrumental in changing the stereotype that pregnant women can't stay in school. They have worked with their student ggvernment and other groups to advocate for better child care on campus. Prior to this group's activism, their women's health center was illegally using student fee money to promote pro-abortion events, while directing students to Planned Parenthood. To stop this injustice, UNC- Chapel Hill SFL went undercover, and caught the women's center showing this unfair bias on tape. The women's center director was then forced to resign after lying to the school chancellor about her actions. Due to these efforts and more UNC-Chapel Hill was awarded Group of the Year Runner-Up at the 2009 SFLA conference in Washington DC. Win One of Three Prizes $500 to $250! Use Human Life Alliance's "Did you Know" or "We Know Better Now" publications as a way to educate students about abortion. Hand out the free publications or create an unique event for distributing them on campus! Do this between February 1st and March 31st and you are eligible to win up to $500 for your group! To apply: Write up what you did to pass out the publications and what the reaction was on campus! Go here for more contest details. Go here to order free HLA materials. Or e-mail us to apply or ask questions.